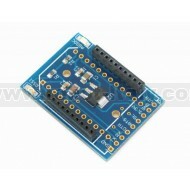 The XBee - Simple Board has been designed to allow an easy and reliable connection between the Xbeeâ€™s modules and your application. €6.92 Special Price! Save until stocks last. 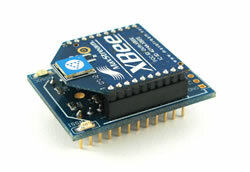 The XBee - Simple Board has been designed to allow an easy and reliable connection between the Xbee’s modules and your application. 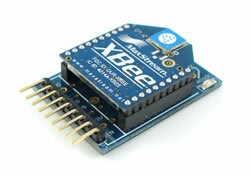 XBee and XBeePRO modules are fully supported, even the new XBee Series 2 is supported. The rock solid construction and the high power voltage regulator ensure the maximum reliability and full performances of the XBee module. 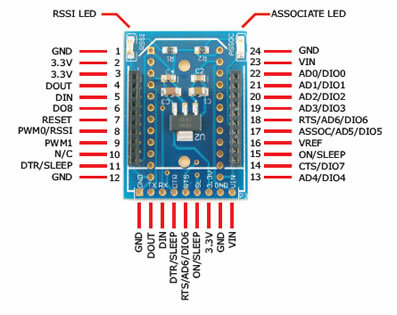 Two useful LEDs allow constant monitoring of the board activity and fast troubleshooting. You can connect the Board in several methods. You can use two 12 pin male headers to use the Board with a standard 24pin 2.54mm DIL form factor or you can use only the pins you need for your application. You can also solder the wires directly to the pins needed. 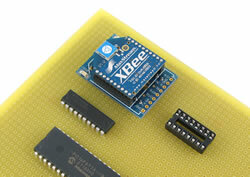 A useful connector is provided on the back side of the Board, here you can find the most important XBee connections. A 90° strip header can be used here or any 2.54mm pitch connector, depending on your application needs. The Board can be powered from a regulated 3.3V source, on any 3.3V pins, or from an unregulated power source up to 18V through the VIN pin. 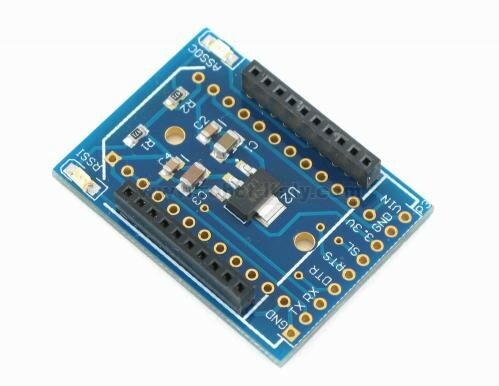 When the internal regulator is used, you can power external devices from any 3.3V pins. The source power depends on the XBee module installed. Part # XB24CZ7PIT-004. 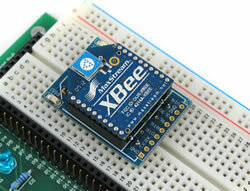 XBee Serie 2 with embedded chip antenna. Part # XB24CZ7WIT-004. XBee Serie 2C with wire antenna.